Reading in English, together with (combined with) listening in English, will help you improve your English a lot. It’s important to read things you can understand fairly easily, without taking out the dictionary at all or very often. The important thing is to understand the meaning of what you are reading, even if you don’t know every single word. However, for people who are not yet reading at the native-speaker adult level, there is one major obstacle (barrier; difficulty): How do you find books that you can understand AND that are interesting to an adult? This issue is a major one for language learners, no matter what language they are trying to learn. The logical (reasonable; clear) solution, at least as far as finding books at the right level is concerned, is to select books intended for (written for) children or teenagers. The downside (problem) is that these books may have themes or subjects that are too juvenile (childish) for an adult. One solution may be to select Newbery Medal award-winning books to read. 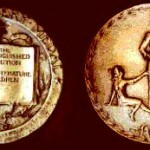 The Newbery Medal is an award given each year to the best American literature (quality stories/books) for children. Yes, these are still books written for children and most of the protagonists (main characters) are children, but after reading many of these Newbery Medal winners in translation in the languages I’m trying to learn, I can say that many of the books have sophisticated (high-level; complex) themes that may still appeal to (be attractive to) adults. You can find a list of these books here. Perhaps even more useful is this research article, in which the authors have calculated (computed; worked out) the grade-level of each of these books, using several commonly-used methods and scales (measurements) (see the last three pages of the article for a list). Obviously, the lower the grade-level, the easier the language, although these lists do not take into account (consider) the reader’s background knowledge or knowledge they already have about the book’s topic, which helps a lot in understanding what we read. This is an adventure and mystery story involving a group of boys being made to dig holes as punishment. They eventually find out the real reason for the holes they dig. This is a science fiction story set in the future about a world that has eliminated (gotten rid of; no longer have) pain and suffering. However, one person is selected to keep the memories for this society, and it is not an easy job, especially for a young boy. This is a story about a boy who wants a dog very badly, and finds one that has been poorly treated by its owner. He wants to do the right thing. Should he give it back or keep it? This is a book in the form of letters written by a boy to an author of children’s books. The boy moves to a new town and his thoughts and difficulties about adjusting to his new family and school situation is told in these letters. A young woman and her brother are the only survivors (remaining people living) left on an island. The young woman must find a way to live. This book is based on a true story. I understand that books in English may be difficult to find in other countries. However, because these are award-winning books in English, perhaps they will be a little easier to find, especially on major book-selling websites like Amazon. (I understand, however, that they may be expensive to buy.) If you have read other books you liked that may be appropriate for people not yet reading at the adult level, please tell us about them by posting a comment. Update: Be sure to read Warren’s blog post about finding reading materials at the intermediate level. He provides a way for you to look at the book’s pages before you decide whether you want to read it, making sure it is right for you. Read it here: Warren’s blog post. Thanks, Warren! This list isn’t exhaustive, we can also add the “Trilogy” written by Stephen Clarke, A Year In The Merde, Merde Acutally And Merde Happens. Theses three books are very easy to understand and, the most important, very interesting (especially for us, French…). I have learned a lot while reading theses three comics novels. Thank you Lucy for these tips. I´ll definitely try these books. Think it´s great to start reading the books for children once again and learn English at the same time. Be kind of a child again. Now I´m biting through the whole goose bumps series by R.L. Stine, and they are cool as well for easy reading. The books by Roadl Dahl are also fine. Recently I have read the book ‘Catcher in the rye’ by J.D.Salinger. Although this is the book for adults It’s quite easily for understanding by people with intermediate English level. Of course there are places in it with difficult phrases and sleng but it has comments about these at the end of this book (something like dictionary which help readers to understand better). If you wish to know more about this bestseller you can find the information on Wikipedia. Thanks Lucy for your interesting information about books. I’ll try to find something from your list. Thanks Lucy for all your recommendations. “The Curious Incident of the Dog in the Night-Time” (2003) by British writer Mark Haddon is easy to understand. Thank you Lucy, It’s kind of you to recommend the books to us especially for improving our reading. I read some English stories and one of them that I already read is “Island of the Blue Dolphins”. It was very interesting story. When I began to read it I coulden’t wait to know what happen at the end especially when the woman (actually a girl) lost her brother and she is alone in the island with the dog that has killed her brother. In Iran most students and adults tend to learn English language. In most bookshops there are a lot of English story books especially in small sizes. We can find them at levels of elementary, preintermediate, intermediate, and advanced. These levels are shown at the back of the each book so you can find the books which are at your level. I can remember some of the stories which I read. They are very interesting, but I forgot the names of the writers. I have to go to my little library. I’ll list them for my friends later. I’m at work now. Dear lucy, You´re perfectly right at saying that reading for learning is a major issue mastering any language but it is also important for us non mother tongue english speakers, listening and then reading it the non-script speech, the natural and up dated use of the language, the way people use the language when telephoning, discussing currents affaires on politics, sports, social and economic situation….. Could you help? Books are no cheaper at all and internet -god thanks giving- is by now the most democratic source for substituying them. My cheap receipt is reading your every wonderful blog post and then linking all the very interesting ones suggested by you and much more ones connected to them, quite simple! !, I know .. but it works..at least for me. Thank you very much Lucy, all the books are in Amazon and they are not very expensive. For me reading is the best way of practicing my English, it helps me to write here also to improve my vocabulary. I have a friend now who is learning English with me and these books would be very useful to both of us, in fact we were looking for interesting easy books for her so it seems you have read our mind. All the best for you dear teacher. Hi! Only novelties, our dear Dr. Lucy. I have not known about Newbery Medal award-winning books. Thank you. In our bookshops there are all kind of English books for any level of knowledge. Thank you Lucy, I agree your opinion. I try to read some novels in English those I’ve already read in my native language. I found it is easy to understand the story in English and learn living English. Dear Dr.Lucy .. I want to add to your list Oxford University Press stories , it has stages of reading , you begin with stage A (based on 700 vocabulary) and as you go all the way up to stage D you wont feel the difficulty of the vocabulary as you progress, of course every once in a while you will encounter new ones but it is no big deal, as long as you understand 92 % at least , it will be fine . that is all I can recommend . I just added an “Update” to my post above with a link to a blog post by Warren with great information on how to look for and to look at books in English, including the books I’ve mentioned above. He gives some additional helpful book suggestions as well. “Check it out” (look at it)! Thank you Dr. Lucy for the interesting post. I would like to recommend a publisher which sold books organized by level of difficulty: Penguin readers. They also have additional materials such as CD, worksheet with questions. for me to read some of them I prefer books with not too much descriptions. Agatha Christie is one of my best writers to read, in Spanish for years but in English she is even better, in fact I would dare to say she is perfect. Try her if you want to read a book not too difficult for adults. Lucy, as always you hit the target, thanks a million. These are the list of the books I read, long and short stories and easy to understand (pre intermediate and intermediate). I think these are very interesting and I recommend them. well. hi again everyone, I want to say thank you to Farahnaz because half of the books he read , I have already done that as well, I think you have a good taste in your collection of literature , well, at least my taste is in harmony with yours, I hope in every thing not only books, I hope that every body else agree with us as well. anyway, I want to tell Emiliano that the writers you mentioned,(not only in this post) are amazing but the drawback is its sophisticated English, why didnt you begin from the very basic english and ” gradually go up the ladder ” (we would say in arabic). That´s true Talal, and I agree with you, Ana a friend´s daughter that is coming home to speak some English with me has the same problem. She needs to read some English books for her level and I haven´t any. Years ago I had level books just to begin with but I don´t know what I have done with them. We have been living in three different houses and hundred, (well I could say more than hundred and hundred , of books were lost in them as I have not place to keep the books safe. I think Lucy is giving us the best recommendation and in fact I can´t now give any valid one. Farahnaz also has a good selection of books and a good taste too, in fact I have read some of them like “The Secret Garden” “The Monkey´s Paw” “The Breathing Method” and four or five more. The Secret Garden is perfect, it´s free and everyone could have the audiobook by free too. It is in the “Gutenberg Project” with thousand free books too. Over there you may find all kind of free books that are in Public Domain. Lot of them are also like audiobooks read by voluntaries who make the job. J. Sheridan Le Fanu was one of my favorite authors, I have read lot of books from him, in Spanish and in English. Another good author to read short stories is “Guy de Maupassant”, he is French but you may find his stories traslated in good and easy English, to me Maupassant is one of the best authors of all times, and I think he is the best to read short stories together with Ambrose G. Bierce., this is an American author but a genious, with several short stories too. It’s nice of you to say that. I believe you are very intelligent that you notice to the other’s opinions. It shows that you are very interested in reading. Thanks for everyone’s recommendation. here’s one US author i’d like to recommend for girls, Nicholas Sparks who’s writen a lot of deeply moving love stroies. and many of them have been adapted into major films. if you are in Beijing, these books can be found in XI DAN tu shu da sha, or wang fu jing wai wen shu dian, or might as well some foreign book’s store.